Edgefield from 3:00 p.m. until 5:30 p.m.
at the intersection of Norris and Bacon Streets, across the street from the Edgefield United Methodist Church and beyond the Post Office. The Tea features many beautiful blooms displayed in an elegant setting offering delectable tea refreshments. Sandwiches, sweets, punch and teas from the Charleston Tea Plantation will be offered. The lovely mid-winter afternoon will be completed amidst a back-drop of music, provided by local musicians. Camellia experts will be on hand to discuss the blooms and the cultivation of this plant so well-suited to our Southern gardens. Recent teas have attracted visitors from throughout the state and have showcased over 300 blooms! 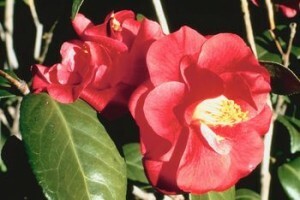 This event is a continuation from 1949 when Edgefield was well-known as a premier camellia growing area and, at that time, blooms were displayed at the home of Joe and Chrissie Holland at their “Camellia Tea”. The Camellia Garden at Darby Plantation, home of the late Douglas Wise — pioneer of camellia propagation — will be open mid-morning for touring. Also featured this year will be the Camellia Garden of the late Rainsford Cantelou, another well-known camellia grower from the early days, at his home “Edgemore” in Edgefield. COME ENJOY A WINTER DAY OF BEAUTY! pleasant day by attending The Camellia tea. A new feature of the 2014 Camellia Tea brings Edgefield Merchants into the event! Look for upcoming details on the “Camellia Scavenger Hunt & Quiz”, in which two visitors to the town and the Tea can win the prize of a camellia plant! For further information, contact Henrietta Humphreys at 803-637-2370. One Response to "Edgefield Camellia Club Tea"